Up until now, in order to extrude and form a dry meat-containing pet food, starches from one source or another have been used. The starches gelatinize during extrusion and create a binding matrix so that the end product can hold together. But only about 30% of the formula can be meat in order for the product to form properly. The rest is predominantly starch, which is a long chain carbohydrate that breaks down into sugar in your pet’s digestive tract. This is how all dry kibble pet foods are made, in spite of clever slogans to convince you otherwise. It is known that starch (sugar) is a prominent cause of dental disease, adult onset diabetes, and obesity in humans and pets. (Obesity is the price to keep blood sugar low. Starch is the drug that drives blood sugar high.) However, starch has more insidious effects not commonly realized. 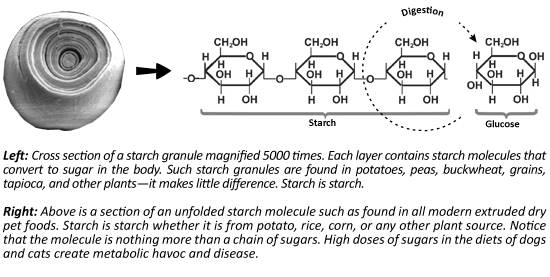 Starch sugar interferes with the metabolism of vitamin C, a critical factor to the immune system, numerous biochemical pathways, and the health of connective tissue. When heat processed in pet foods, starch sugars create organ toxic, age accelerating, and carcinogenic compounds such as acrylamides and advanced glycation end products (AGEs). 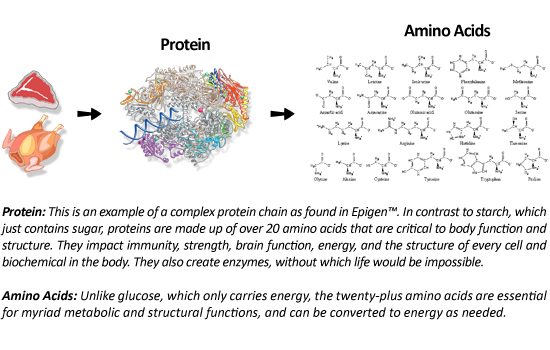 Wysong Epigen™ breaks from this mold with new technology that requires no starch in the extrusion process, but rather uses natural, healthy protein chains derived from vegetable and meat sources. We can now successfully extrude kibble with exceptionally high levels of meat, 60% and even greater! This means pets can get a diet that they are genetically programmed for, and with that, greater health. Is Starch Free™ Epigen™ just like all of the "Grain Free" pet foods? The problem with dry extruded kibble pet foods has been that starches (poly-sugars) are a significant ingredient. Starches are not a natural component of the canine/feline diet. In spite of marketing efforts that would have you believe otherwise, Grain Free diets do not contain more meat, nor are they more natural or more akin to what dogs and cats eat in the wild. Grain Free products have only removed grains in favor of other starch ingredients. Taking out the more nutritious wheat, rice, and other "grain" ingredients and replacing them with potato, tapioca, peas and the like doesn't actually make the diet any more natural or genetically appropriate. Think about it… are potato and tapioca any more natural to canines and felines than wheat, corn, and brown rice? Do wild cats and dogs forage for potatoes and roam far and wide in search of tapioca and peas? Of course not. The underlying issue -- which is that carnivores are not designed to consume a constant diet of starch -- remains unaddressed. Our patented Epigen™ returns truth to the pet food arena and changes the market by exposing the Grain Free myth for what it is. Epigen™ does what Grain Free diets have only pretended to do -- Epigen™ removes starches, is 60% protein and 60+% meat and organs, and is the most genetically appropriate dry kibble diet in history. No more "Grain Free" and "no this-or-that ingredient" deceptions. The fact that dry pet diets contain starches (polysugars) is being hidden from consumers by clever distractions. Rather than make fundamental changes in manufacturing and actually remove starches and sugars, slogans are used. Some claim meat as their first ingredient, others have "no-this-or-that ingredient," with the newest and perhaps most widely used catch phrase being "grain free." All such slogans are intended to convince consumers that such foods are predominantly meat and absent starch and sugar, but they aren’t. All extruded pet foods contain carbohydrates and starches in one form or another – rice, oats, barley, corn, other grains, potato, peas, tapioca, etc. Such ingredients are used to decrease costs (starches are cheaper than meats), and, as explained, to enable the final kibble to stick together (to form a binding starch matrix). Regardless of the starch ingredient used, such starch-based pet foods are all equally foreign and unnatural to companion animals who are genetically designed for a diet high in meat and fat, and low in starches/carbohydrates. This does not mean such diets are harmful – unless, and this is an important unless – they are fed continuously at every meal. The problem is, nearly the entire pet food industry, Wysong being an exception, advises the unhealthy practice of feeding one food meal after meal, day after day. It is all justified by the myth that processed pet foods are "complete and balanced." Such singular feeding of starch-based pet foods sets the stage for a host of chronic degenerative diseases later in life: arthritis, diabetes, obesity, dental deterioration, skin disorders, allergies and sensitivities, auto immunities, cancer, heart and other organ failure, and generalized loss of vitality. Epigen™, along with the Wysong TNT™ processed raw Diets (Archetype™, Dream Treats™, UnCanny™, Rx Diets™), the original Wysong dry and canned diets, Wysong nutritional pet supplements, and fresh food feeding as described in the Wysong Optimal Health Program™ (see Wysong.net) is the solution. Don’t be fooled – "Complete and balanced," "grain free," "gluten free," "no corn," "no wheat," etc. does not mean more meat, nor does it mean less starch and sugar than conventionally extruded foods that have been on the market for sixty years. Epigen™ is the first conventional pet product to truly break from the starch handcuffs and thus liberate your pet’s health potential. Is Epigen™ just another "no" product? Not really. It is a "yes" product. Yes it contains the ingredients that most closely resemble what a carnivore would eat in the wild. Of course, "no" it does not contain things that are not a normal part of the carnivore’s diet, like starch carbohydrates. The Pet Food Industry is one that is driven by trends. One company develops a slogan and forms a niche, and then other companies develop like products to garner a piece of the pie. The actual health value of the trend is often never actually examined, other than superficially. Health falls secondary to the profit potential. By contrast, the impetus behind Epigen's™ development is health. Epigen™ is not just another name for another me-too product on a bandwagon trend. In fact, Epigen™ stands fundamentally in opposition to the composite of marketing trends that have accumulated for about three quarters of a century to create what is known as modern natural and premium pet foods. Wysong's position on Epigen™ is the same as it has been for every other product we've developed in our 30 year history. We do no market analyses, rather, we try to do what is health-right using reason and good science. Maybe it will become a market, maybe it will not. We have faith that eventually, thinking people "will come." In the meantime, we can be at peace knowing we have held true to our objective of treating nutrition as the serious health matter that it is.